Keep your skin care routine in check while on the go. 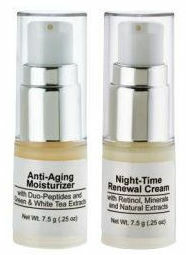 We are offering two awesome moisturizers in a convenient TSA compliant travel size. Moisturize skin overnight while replenishing needed nutrients with this rich blend of retinol, minerals and natural plant extracts. Retinol works deep within the skin's surface to diminish the appearance of fine lines and wrinkles.